The view from Moro Rock in Sequoia National Park, located within California's southern Sierra Nevada mountains. The study, "Potential decline in carbon carrying capacity under projected climate-wildfire interactions in the Sierra Nevada", published this week in Scientific Reports, shows another facet of the impact current man-made carbon emissions will have on our world if big changes aren't made. "What we've been trying to do is really understand how changing climate, increases in temperatures and decreases in precipitation, will alter carbon uptake in forests," said University of New Mexico Assistant Professor Matthew Hurteau, a co-author on the paper. "The other aspect of this work is looking at disturbance events like large scale wildfires. Those events volatilize a lot of carbon and can kill many trees, leaving fewer trees to continue to take up the carbon." According to Hurteau, who worked on this study with colleagues from Penn State and the University of California-Merced, roughly half of all human-emitted carbon is absorbed by vegetation and the ocean, and is stored through natural processes – something that helps limit our actual carbon impact on the atmosphere. The problem is, as forests begin to change, due to global warming and large scale fires, the amount of forest carbon uptake will decrease, accelerating the amount of man-made carbon making its way into the atmosphere. "Our simulations in the Sierra Nevada show that the mean amount of carbon loss from the forests under these projections could be as large as 663 teragrams," said Hurteau. "That's equal to about 73 percent of the total above ground carbon stock estimated in California vegetation in 2010." Hurteau and his colleagues used climate projections from the Intergovernmental Panel on Climate Change and run ecosystem model simulations, where they look at individual tree species in the Sierra Nevada to understand how projected climate and wildfire will influence where those trees will be found in the future and how quickly they'll grow. 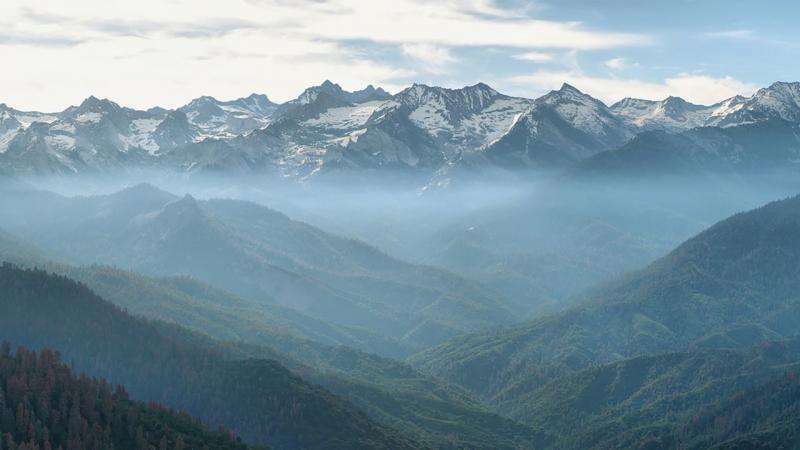 Using that data, researchers are then able to determine the expected carbon uptake – which, if things continue moving in the same direction, will see huge declines across the Sierra Nevada mountain range over the next 250 years. The two factors that influence these findings are changes in climate and the likelihood of large scale forest fires. Because California is experiencing warmer and dryer conditions due to global warming, certain tree species are not able to flourish across particular geographic regions like they once were. Less tree growth, means less carbon uptake in forests. The study also shows that wildfires will play a big role in the reduction of stored carbon. And while many of these incidents will occur naturally, Hurteau says we are, in part, to blame for their significance. "We've been putting out fires for a hundred years, causing tree density to go way up. In the absence of fire that system has a lot more carbon stored in it," explained Hurteau. "But, when you have these large fire events the amount of carbon stored in the system drops because it kills many of the trees. Whereas, in a forest that's been maintained by regular forest fires, which is the natural ecological state, your total carbon at any given point in time can be lower but it stays more consistent." Hurteau says researchers have identified strategies for reducing some of the fire risk by actively thinning forests to manage tree density and restoring surface fires. It's an idea that seems counterproductive until you consider how volatile these ecosystems are due to the risk of large scale fires that end up destroying hundreds of thousands of acres. "Part of my responsibility as a publically funded researcher is to identify issues that these systems face, draw attention to them and then figure out what the impacts of those issues are," he said. "Directly from that work, we also want to try and identify solutions to these issues." Hurteau says he hopes this work will help policy makers in California gain a better understanding of what needs to be done to maintain these forested ecosystems. He says it's not only for the benefit of nature but for all of us, since healthy ecosystems lead to cleaner, better regulated water flow to communities across the western United States. Why would any intelligent person use Breitbart News as a source for science information? It's the cognitive form of rolling coal.